Challenging operating conditions call for innovative solutions, and WIKA’s “hydraulic gauge” has been designed from the ground up to handle the most adverse service conditions. 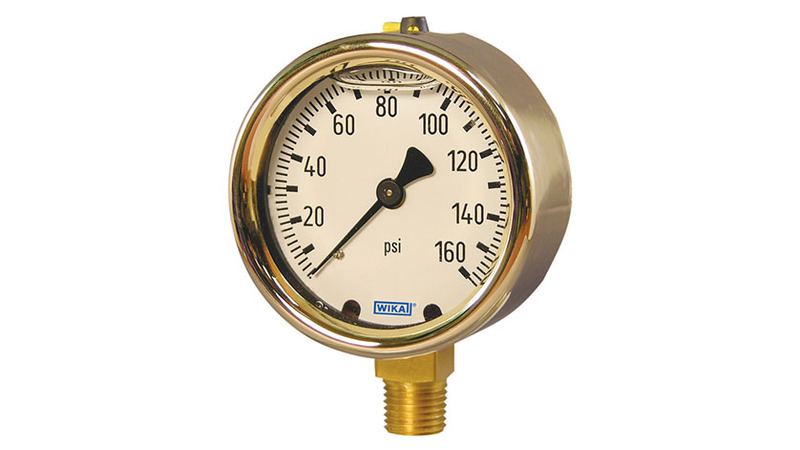 This rugged, fluid-filled gauge has a solid forged-brass case and socket, and has been reinforced to withstand extremely high vibration environments. The hydraulic gauge is also highly shock-resistant and can measure pressure ranges up to 15,000 psi. Hydraulic systems are known for high vibrations, pulsations, and pressure spikes, and a conventional pressure gauge would not last long under those conditions. After examining thousands of failed instruments, WIKA’s engineers determined that vibration is the number one cause of damage to instrumentation. That’s why WIKA has taken great pains to make their hydraulic gauge as vibration proof and shock proof as possible. WIKA designed the Model 213.40 hydraulic gauge to be tough, and withstand the harshest environments. WIKA learned that although the case is made of a solid forged brass, portions of the case cold show oxidation from the elements after years of usage. So WIKA paints every Model 213.40 hydraulic gauge with a high gloss protective gold paint right before the gauge is assembled. WIKA also attaches a gold plated cover ring over the case to compliment the gold painting. WIKA also provides a variety of mounting options for the Hydraulic gauge. Panel mounting and surface mounting flanges are available with chrome plating or highly polished brass surfaces. Also, the lists of options that are available for the Hydraulic gauge are endless and include such OEM favorites as dials with their corporate logos and 100% liquid case filling without air bubbles so the vision of the operator is not obstructed. A variety of applications exist for a rugged, reliable hydraulic gauge like WIKA’s Model 213.40. The mobile hydraulics industry has a long history of using hydraulic gauges as instrumentation on construction machinery, agriculture and forestry machinery, and material handling equipment. This gauge is used because it can withstand the extreme vibration and shock from the machinery. The stationary hydraulics industry uses hydraulic gauges for instrumentation on machinery like presses, stamping machines, rolling machines, and forming machines because of the extreme pressure spikes and surges from the hydraulic systems. A new and growing application for hydraulic gauges is for portable equipment. Hydraulic gauges are being used on portable hydraulic power packs that generate high hydraulic pressure for hydraulic tools, which include torque wrenches, jacks and shears. Hydraulic gauges are also being used in portable compressors for construction tools and equipment, as well as being used in portable pumps for reservoir drainage, irrigation systems and storm water handling. The reason the hydraulic gauge is ideal for all these applications is because they all involve extreme vibration, pulsation and shock, which usually renders standard pressure gauges useless, leaving machinery and equipment inoperable until a replacement gauge can be been found. For this very reason, firefighting truck manufactures will only specify hydraulic gauges for their panel gauges to read water pump pressure because they know firefighters demand that their equipment works 100% of the time, with no exceptions. Because its robust construction, the WIKA hydraulic gauge is capable of handling the most extreme service conditions. For more information about WIKA’s hydraulic gauges, contact our support team.